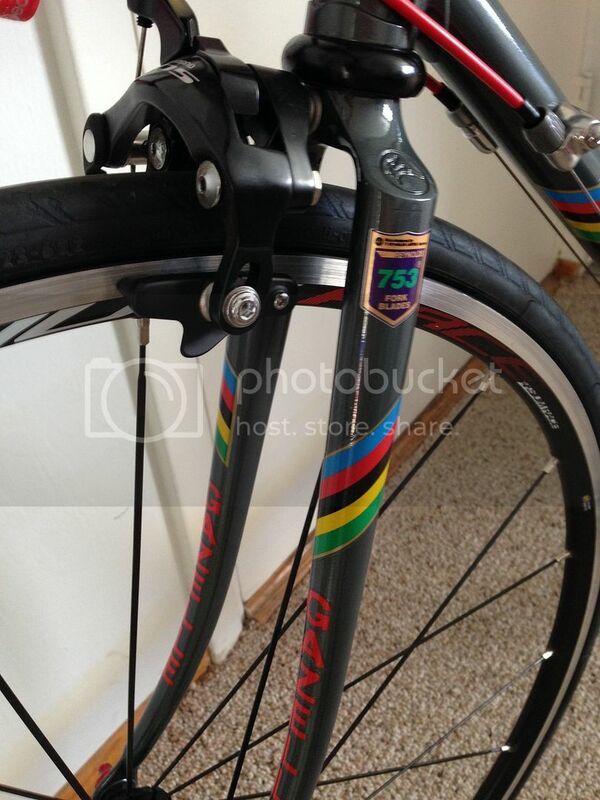 I just finished this 753 framed Gazelle with a Shimano 5700 105 compact double groupset and Mavic Axsium Race wheels. 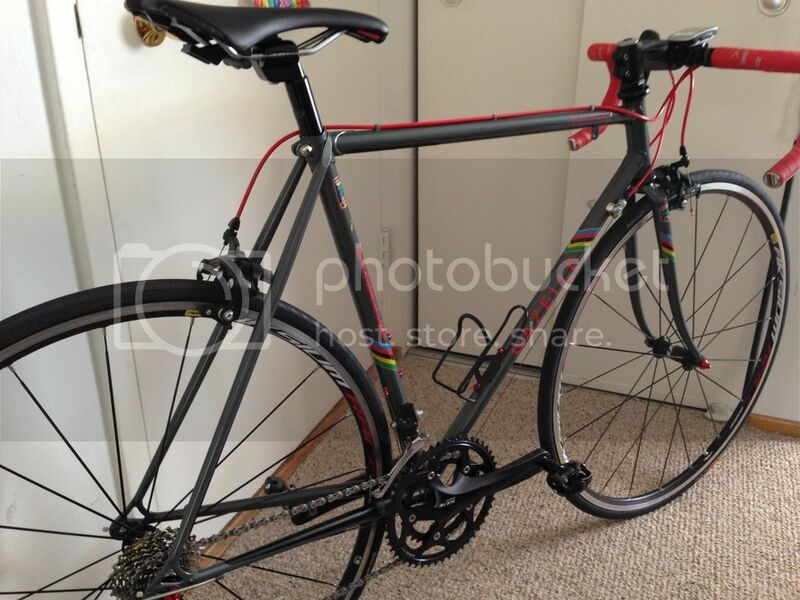 I've put one 20 mile ride on it and that was enough to convince me that this will be my new number 1 bike for a while. 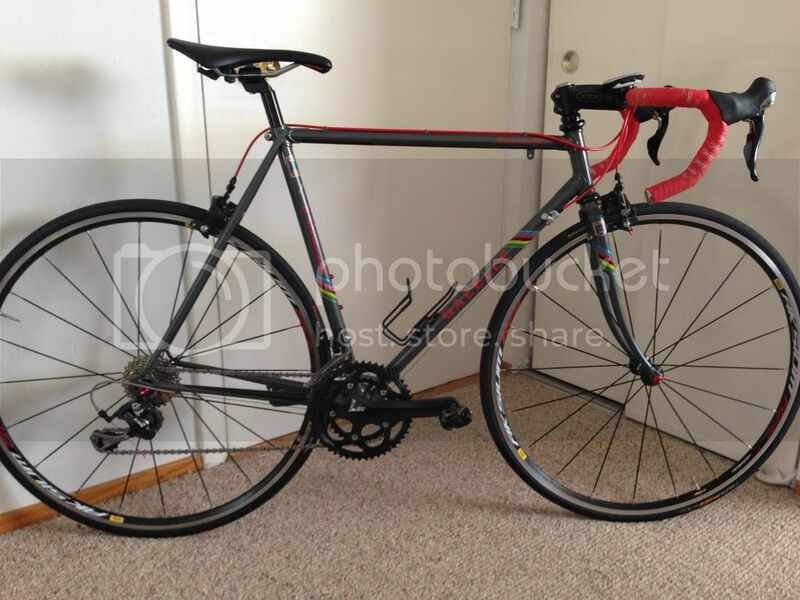 The bike came with a used up Shimano Sante group and Campagnolo wheels. The original white pearl paint was in very poor condition. But the bike cleaned up nicely! The last pic is one of the eBay auction pics that show how it looked when I got it. Really nice! I have a 1985 AB frame Gazelle, and it is far and away my most comfortable ride. Have fun with that beauty! 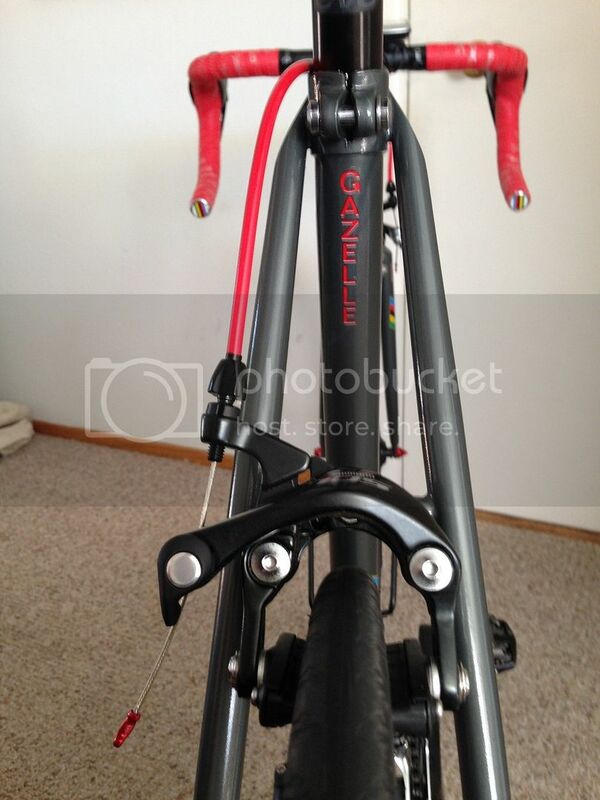 Nice, now all you need is a stem and seatpost worth of the frame and fresh group. Sweet. Don't see that color on Gazelle much. Me likey. Bikes: A green one, "Ragleigh," or something. Complete transformation. No more Mr. Nice Guy. Did you really need to go with the long cage RD, or were just being careful, in case you decided to go with bigger cogs? I am assuming if you're riding in the bay area, you've got some crazy hills. 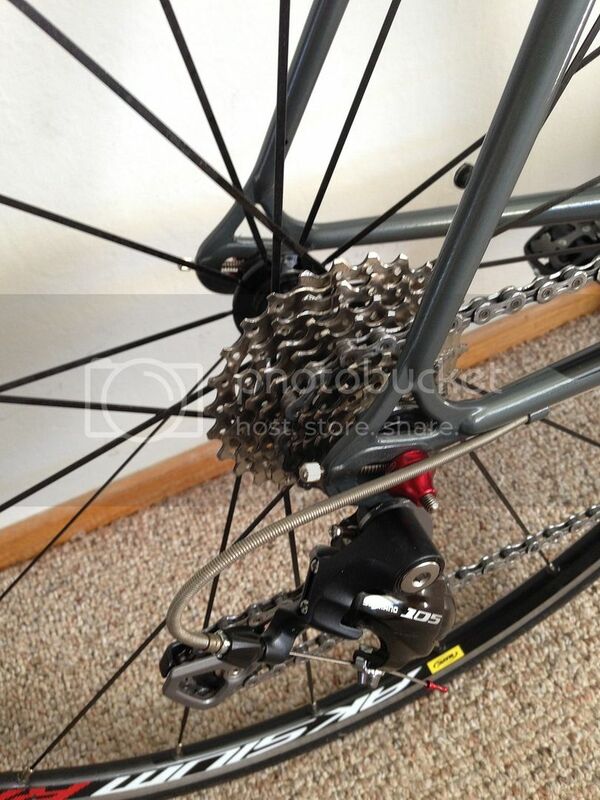 I'm using a compact double crankset because of the hills where I live. You need the long cage rear derailleur with a compact double or at least that's the way shimano packages their build kits. Thanks and agreed! 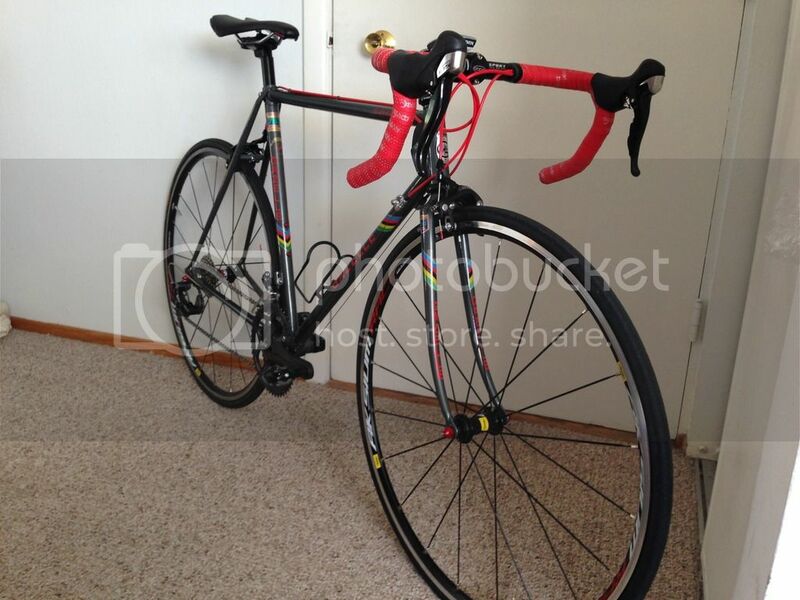 I'm looking for a nice black Cinelli XA stem to replace the Coda stem on there now. I will probably replace the bars at the same time to something with less drop and more reach. Seat posts are a tough one as it takes a 26.8mm. There are not many options. Quick looking steed ! How was it painted ? It is quick and a great climber. It's a little twitchy descending but I think a bar change will calm that down. I stripped as much paint as I could chemically with paint stripper and then I bead blasted the remaining paint that wouldn't come off. I sprayed the bike with a self etching primer followed by Alsa Paint's "Killer Black Pearl" in a spray can. Then I applied the decals and sprayed the bike with Eastwood 2K Gloss Clearcoat. I wouldn't recommend the Alsa paint. The can did not spray well and the paint was very thin. 1 can barely covered the bike. And the color although interesting was not a pearl color as advertised. I got the decals from an ebay store called Cyclomondo. I have used Velocals decals in the past and I think Velocals makes a better decal and I will go back to using Velocals in the future. Just wondering why you moved away from the original color scheme? Not a criticism btw. I have a Campy 26.8 seatpost, but it's silver. Just wondering why you moved away from the original color scheme? The original paint job was trashed, the bike was heavily chipped and the paint was brittle and oxidized. 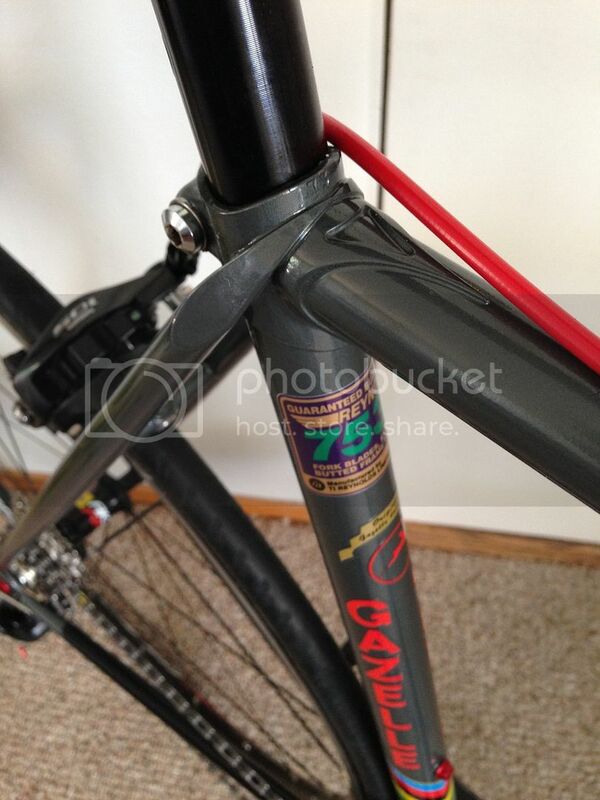 There was also a bit of surface rust but I felt the Reynolds 753 frame was worth rescuing. I suspected the single stage pearls would not work and didn't want to end up with plain white bike so switched to a different color. I'm always drawn to the pewter/red color combo probably because my first real bike, an '85 Trek 520 came in that paint scheme. I have an '81 AD in off-white ('Sand') which should be re-painted & decal'd. I want to keep the same color and wondered why you switched. Probably should have it powdercoated for better color matching. Nice! I'm sure the gang in Dieren would do a double-take if they saw that. Bikes: Many, mostly steel and titanium. Myfirst carbon bike a Kestrel from 1989, failed and since that time I stayed away from plastic bikes. Unfortunately they wouldn't, there isn't a racing bike in sight anymore. After steel and aluminium, they stopped making them, they didn't go the " bake 'm in China slap on our name carbon route" v like so many other famous names. Bike ID from Seat stay Cluster only? All times are GMT -6. The time now is 08:35 PM.